I’ve been perfecting my Christmas Sugar Cookies (cut outs) for 20+ years. 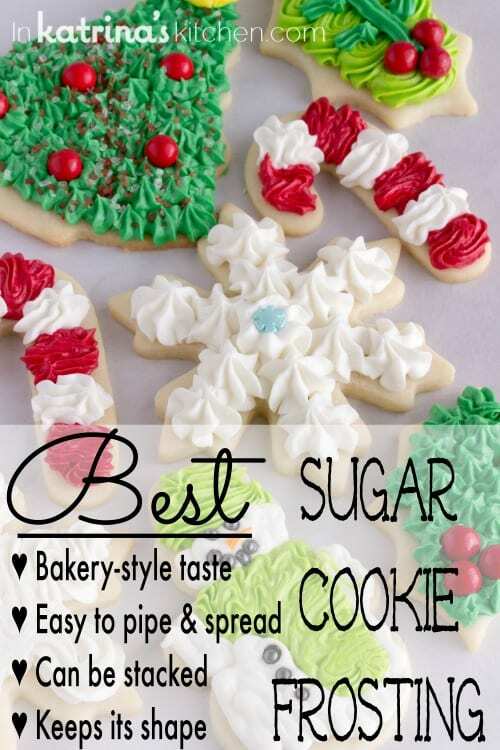 This is the BEST Christmas Cookie Frosting recipe I use to top them! Most people have strong opinions about politics, religion, global warming, etc. I mean these are important things so I get it, but I have opinions about cookies- especially cut out cookies and the frosting that tops them. The cookie needs to be sturdy enough to hold a generous amount of frosting. Soft cut out cookies only please! Keep the sprinkles to a minimum… I’m trying to enjoy the frosting, not break a tooth. Finally, the frosting needs to not be sticky. I have children running around my house with cookies in their hands. I don’t need the frosting sticking to them and whatever they touch (and they touch EVERYTHING). See that tree? It’s approaching breaking Rule #3. I better eat it. Okay, honestly there aren’t very many cookies I would pass up. 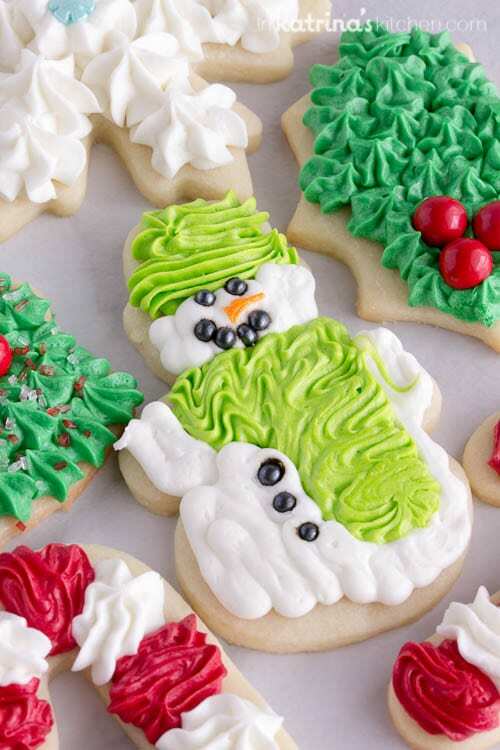 But I’ve been perfecting my BEST Sugar Cookies Ever and this BEST Sugar Cookie Frosting for over 20 years. I don’t know why I feel so strongly about using the word “best,” but I do. It’s the most popular recipe on my website and the most requested recipe from family and friends. Can I use this frosting on Valentine’s Day cookies? Halloween? National Mail Carriers Day? etc. Yes! 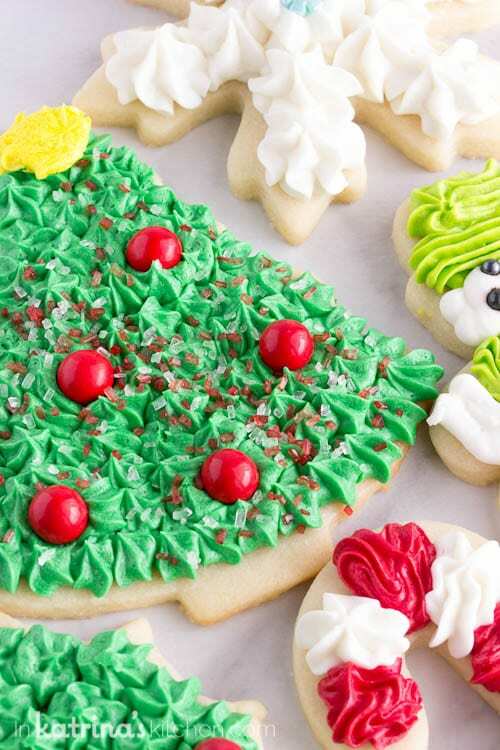 Use I use this frosting recipe for nearly every cookie I make all year long. You can use it to frost cakes as well! Ewww shortening is DISGUSTING! How could you?! I’m sorry to ruin your life. There’s good news and bad news here. The good news is that you can use whatever frosting recipe you want! The bad news is that you have to follow this recipe to get the stated results. Shortening (Crisco is what I generally use) makes this a “crisping” frosting. It will hold its shape days after being piped onto cookies. It won’t melt or wilt and isn’t sticky like store-bought frosting tends to be. I can also stack cookies for freezing and/or transporting after the frosting crisps up (at least 2-4 hours). More good news- there are organic all vegetable shortenings available out there in Internet land. I linked to one at the bottom of this post. I’m still disgusted about using shortening. I’m going to use butter. Can I use butter…? You can use 1/2 cup of butter and 1/2 cup of shortening with similar results… but please don’t email me saying that the frosting didn’t crisp up and it didn’t hold its shape very well. If you want to use all butter, well then you are making American Buttercream. Good on ya! It’s delicious and I frost my cakes with it. Everyone I know has a nut allergy. Can I omit the almond extract? You’re in good company, my son has a peanut allergy. My heart is happy that you want to accommodate all of the special dietary needs in your family and circle of friends. Bless you!! Always best to check with the person you are serving the cookies to, and of course let their doctor or allergist have the final word. If you are uncomfortable you can omit the almond extract and use all vanilla extract. How long and how can I store this frosting? Leftover frosting should be transferred to an airtight container and stored in the refrigerator or freezer until ready to use. It can be stored in the refrigerator for about a week and frozen for several months. Use leftover frosting just as you would freshly whipped frosting once it is warmed up and ready to spread. Bring it back to room temperature or to just slightly chilled. Do I need to refrigerate frosted cookies? As I’ve always understood it the small amount of milk is stabilized by the large amount of sugar and considered safe at room temperature for two to three days. But of course do what feels safe for your family. We eat these within 2-3 days. Those are really bright colors! What food coloring do you use? I never use liquid food coloring (typical food coloring that you can find in the grocery store). 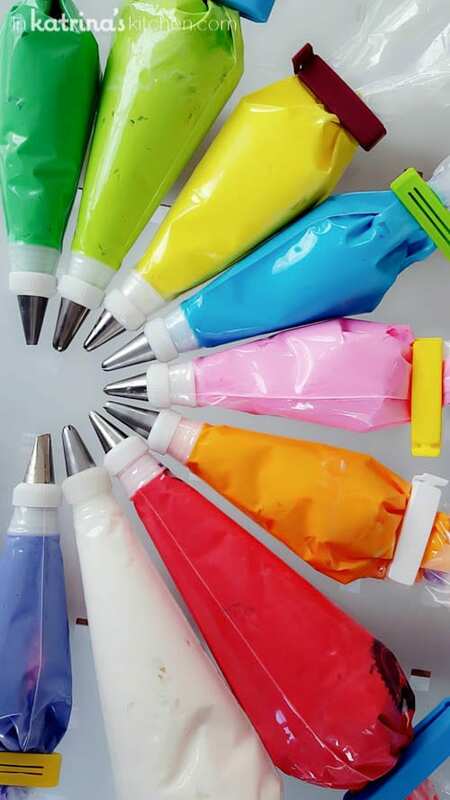 I prefer to use food coloring gel such as Americolor or Wilton. You can find food coloring gel online (I link to it at the bottom of this post), at Hobby Lobby, JoAnne’s, Michaels, or even some Wal-Marts in the crafting/cake decorating section. I prefer gels because you only need a few drops to get a vibrant rainbow of colors. I've been perfecting my Christmas Sugar Cookies (cut outs) for 20+ years. 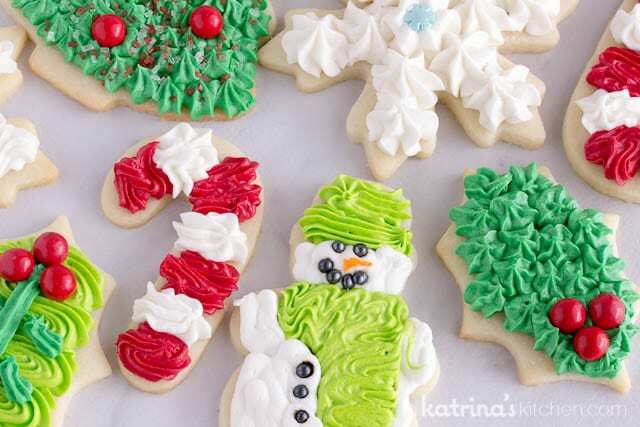 This is the Christmas Cookie Frosting recipe I use to top them! In the bowl of your mixer fitted with the paddle attachment, or in a large bowl for use with your handheld electric mixer, place shortening and extracts. Beat until creamy (at least 1 minute). Begin adding powdered sugar 1 cup at a time. When the mixture starts to become dry start adding cream a little bit at a time alternating with the powdered sugar. Shortening is what makes this frosting "crisp" up. You can swap half for butter but it will melt/fall more quickly and may colapse if cookies are stacked on top of one another. If you swap out for all butter well then you are making Buttercream frosting- perfect for spreading on cakes but not preferred for piping. At the bottom of this post I will link to an organic all vegetable shortening. Always ask your doctor when dealing with food allergies. Our family has a peanut allergy so we avoid all nuts. I have safely used IMITATION almond extract with him. This is personal experience only. You can use all vanilla extract if you wish. 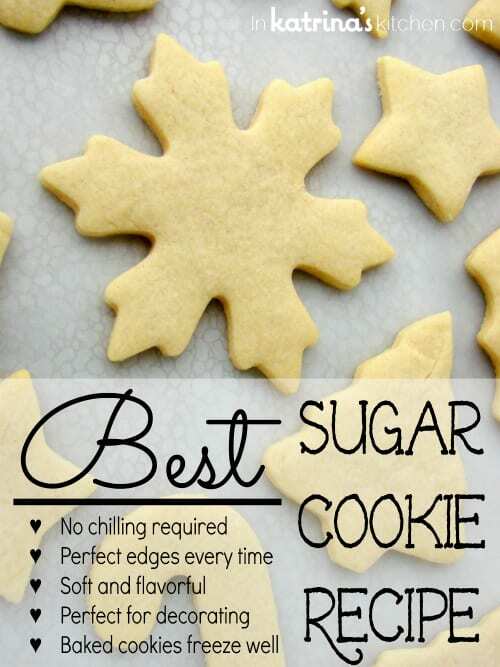 Don’t forget to grab my Best Sugar Cookie Recipe while you’re here!